I've heard rumors and first hand accounts of snow in NC. In fact, I have a video that I'll try to load on here later, with the famous Cherokee Gill, retired race dog extraordinere, cavorting in the white stuff. It was sent as a little birthday gift, since Cherokee is at home with friends while I am gone. My heart goes all soupy and sweet when I see a dog around here, evidence that I am missing my great big studio buddy. Anyway, check back later in the week since I have to figure it out and it may just remain a big mystery if the technology is too much. It's been a lovely foggy day in Florida. We had a great big storm last night, and cool air moved in to create this Englandy looking atmosphere. I've always had a thing for fog. I've always liked hot tea. Hmm? Was I really supposed to have been born in the South or am I really just a misplaced Brit with a slightly funny accent? Since I'm not working with clay in the near future, my thoughts turn to painting and drawing. Just before I left home I took my car to the auto car wash for a well-deserved bath. I love the fact that they have great vaccum cleaners. So powerful it sucked up my ball point pen. I wonder if the job perks include dividing the small change or even bills, jewelry, etc that make their way to the bottom of the vaccum cleaner? Anyway, while riding through, I thought how cool that soapy world looks, so took some shots for future reference. Everything is new again! I have been cruising the blogs occasionally to see what's been happening out there. I have been on vacation, enjoying some well deserved time with family and starting on a study of courses that will occupy me and keep me away from the studio until the end of May. Today I walked around the neighborhood (Florida, not NC) and it was a breezy, chilly, sunny morning. Quite nice. Don't know if the FL natives like this cold spell but it suits me just fine. I have to figure out how to load my camera pictures on this computer, so no new images for a bit. 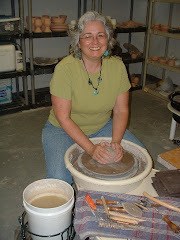 There was a great article in Ceramics Arts Daily last week about mass production of pottery design. I read it with interest. It really covered the good points and bad points of such a self-financed venture. I can see how satifsying that would be for an artist/craftsman that had the goal to bring well-made work to the marketplace at large quantities. I did have to explore some of my own prejudices about the concept, but realized that I enjoy a lot of products that fall in that middle space--well designed, aesthetically pleasing and in an affordable range. They are NOT the same as the individually made cup. But I would reach for them and the experience would be more pleasing than that cylinder that comes in a rainbow of colors. I think the thing that I would miss most about the experience is the story behind the work itself. I do think of the person or place or time that I got a cup or mug from and to me, that is an important part of the drinking/eating experience. Now, I'm not saying that I have a concious remembrance every time I drink, but it's there, in the background like ambient music or a soft pillow. Maybe it's just "padding" for the everyday battle of life! Anyway, I appreciated the article. Take a look for yourself. Tell me what you might think. Have a great day!